In the middle of Africa an ancient yet advanced artefact is discovered far beneath the Earth’s surface and Paul Reece, heir to a huge mining corporation, leads the mission to uncover its mysteries. 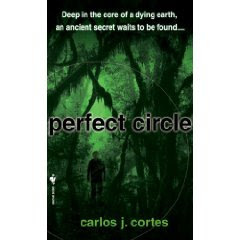 ‘Perfect Circle’ is an engrossing adventure that mixes ancient mysticism and philosophy with modern business and politics, intriguing characters and interesting relationships, mining technology and social observation. It’s Cortes’ first novel and I’m suitably impressed.